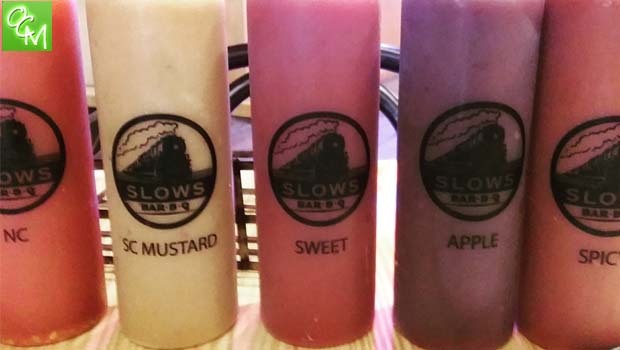 Slows BBQ Pontiac review, pics, hours info, and menu info – Slows BBQ has been a BBQ staple in downtown Detroit and now has a location in Pontiac MI. Slows BBQ Pontiac is located at 8 N Saginaw St in downtown Pontiac. Parking is available street side at the meters. Slows BBQ Pontiac location is all new…it is clean and themed with a lot of warm woods. It’s not overly rustic, so it’s more modern combined with wood trims. cornbread. The biggest differences between the Slows BBQ Pontiac and the Slows BBQ Detroit menus is that there are no Hoagies and no Combination platters at the Pontiac location. Other than that, there’s just a few things here and there that are not at Pontiac. mustard BBQ sauce and probably my favorite; Apple, a very pronounced Apple flavor making it even sweeter than the sweet sauce; and Spicy, a more traditional sauce with only the slightest trace of hot… making it an option for anyone that can handle a small kick. had BBQ on metal trays lined with brown paper and all of the food is served on it…the entree, sides, etc. At Slows BBQ I found it a little odd that they served the food on white porcelain plates. Everything had its own plate so they brought me a pile of brisket on a plate, and each side on separate plates. It resembled a table setting from a buffet dinner. Ok, so that’s a bit picky. Here’s the bigger disappointment…I did not care for the brisket. I understand that brisket tends to be a fattier meat, but the brisket that was served to me was more fat than meat. No joke. I took all the fat off and there was barely any meat left with twice as much fat as meat. Even the waitress said that was pretty bad and she went back to the kitchen to get me more. That’s great service and I appreciated it. But even so, I didn’t find the meat to have the best flavor. The seasoning and the BBQ flavor were extremely faint and you were left to rely on the sauces for flavor. Maybe it was just an off day, I don’t know. But, if I go back, I won’t be getting the brisket.